St Ninian’s High School Eco-Club | Not just any other Eco-Club! After a lengthy absence, the BLOG is back and means action, quite literally. We are busy getting our Green Flag application together and have planned our Day of Action. It is happening on Thursday 6th June and it has a waste minimisation focus of Reuse and Recycle. Pupils are going to bring in old books, mobiles, clothes and plastic bottles to be reused and recycled. Our poster advertising the day is below. We have produced a short Eco Club newsletter of recent activities that we will be handing out at St Aidan’s Church (Mearns Road) Eco Fair this Saturday 8th October (12-3). They will have stalls with advice on how to ‘go greener’ (including saving energy to save you money), cookery demonstrations, Fairtrade goods, ’grow your own’, talks and tea/coffee. Children’s attractions include special performances of a musical, bulb planting, games and livestock. We have thought long and hard of how to present our Eco Code and what should be in it and what our school should be trying to do. Here is our finalised Eco Code that is going to be presented to each year groups assembly and put up in every class room. PS The poster for classrooms has our logo and pictures on it so it’s a bit more attractive looking! Hopefully! 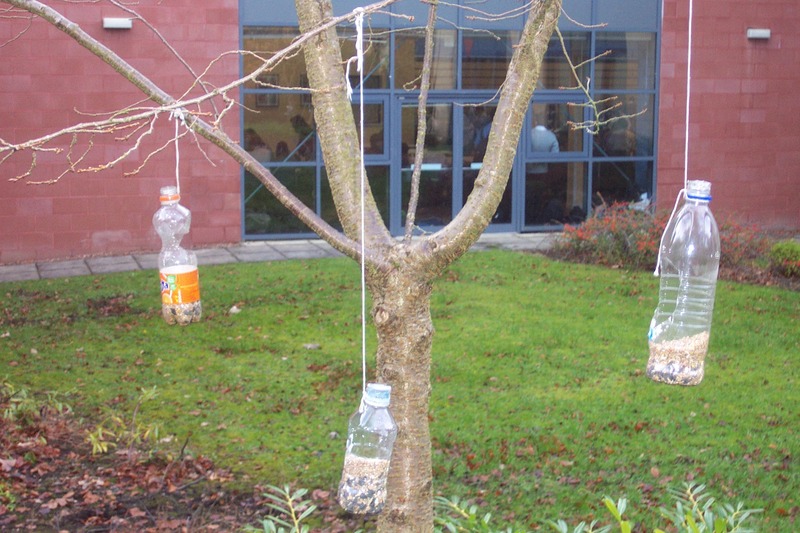 Some of the bird feeders that we have made from recycled plastic bottles. They are proving very popular with the surrounding birds and even some squirrels. I suppose they deserve some food too given the snowy weather in December! We were shown these videos which are pretty cool and will tie in with our Energy topic nicely. We might use them to show to whole school assemblies. We have just been informed that we have been awarded the Eco Schools Silver Award. Well done to all those pupils involved with the Eco Club for their hard work this year. It has really paid off. We can start working towards the Green Flag which we can hopefully get next year. The environmental cost of googling? Our school resource librarian has drawn my attention to this interesting article reported on the BBC website. An academic from Harvard University in the States has claimed that just two searches on Google produces a similar volume of Carbon Dioxide emissions as boiling a kettle.